A low pressure system centered at about 42.8 N / 23.2 W, or roughly about 400 miles northeast of the Azores and is moving north northeast toward colder water. Satellite imagery has show convection building on the northern side of the low over the past few hours. There is a small window of opportunity that this could be classified as a subtropical depression or possible a subtropical storm before gaining extratropical characteristics. The latest satellite imagery shows that the low has wrapped convection around the center of ciirculation. 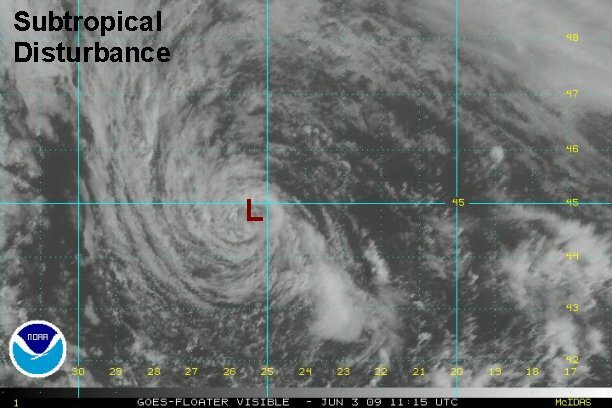 It appears to us that the low could be classified as at least a subtropical depression, and maybe a minimal subtropical storm. The low has moved out the of "floater" imagery grid so we are able to view any more good satellite pictures of it. This system may go as the previous two "close calls" and not be named. NHC said the system may be classified, but is moving over colder water......translation: If it's not absolutely, definitely, worthy of classification were not messing with it. The low is moving farther north of the Azores and is over water in the low 60's. It appears that NHC does not want to classify this system being well away from the U.S. and Caribbean. The satellite imagery has supported this being classified as at least a subtropical depression and probably minimal subtropical storm. Convection has wrapped around the low center today and continues on the south side of the low. After moving north northeast yesterday away from the Azores, the subtropical disturbance has now slowed almost to a stop. The first signs of an eastward motion have just started. 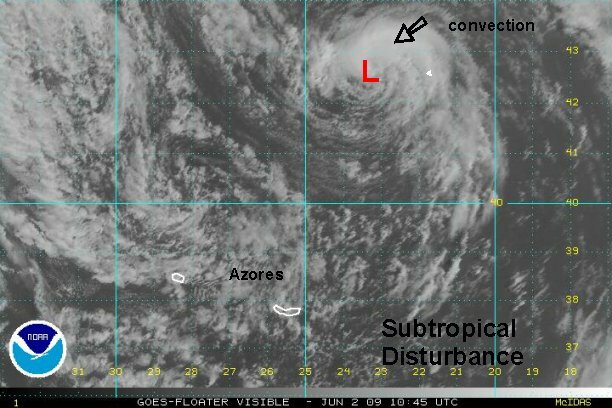 It is centered near 44.8 N / 25.4 W or a little less than 500 miles north northeast of the Azores. The subtropical disturbance is staying over water with temperatures of about 60 degrees or slightly warmer. Water temperatures should not change much as the low tracks eastward toward France. 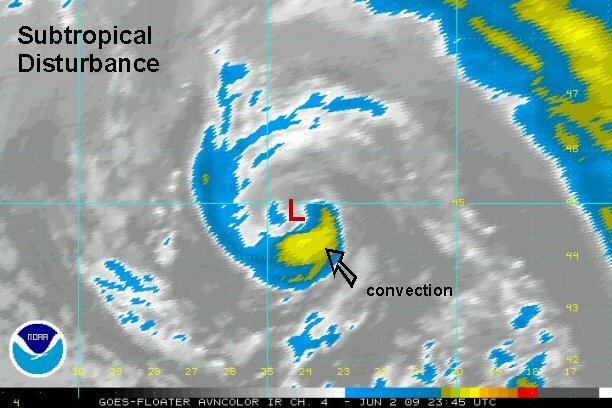 There is still a small doughnut of convection near the center. the convection has decreased since yesterday and there appears that there is very little chance that NHC will classify this one. This will be our last update on this low pressure system unless it is classified by NHC.